Bruichladdich "The Laddie Ten" 10yo (46.0%): Another belated post about the long awaited flagship expression of Bruichladdich which was actually launched all the way back in September last year. Jim McEwan was aging this beauty patiently for the last ten years. It is the spirit distilled right after the reopening of the distillery in 2001. 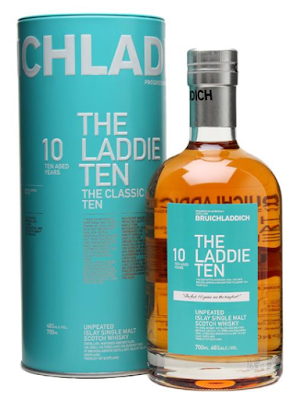 The Laddie Ten will be one of the three permanent expressions of the distillery along with Octomore and Port Charlotte. Color: Bright yellow gold. Nose: First some sour aromas are hitting the nose but after allowing it air a while it disappears quickly and we end up with a huge muesli bowl topped with baby bananas, juicy cantaloupe slices, fresh pineapple and peach compote halves with cold milk and bunch of flower honey poured on top. Yum..! It's a juicy, sweet fruit feast. It's also brisk and salty like a refreshing early morning sea breeze still with a hint of aged cheese aromas coming from ex-sherry barrels which are just a few percent in the mix. A splash of water adds some doughy lemon butter cookies and chamomile. Palate: Creamy mouthfeel. More fruits: mango, strawberry, apricot and guava with a pinch of sea salt. Water amplifies the saltiness and makes it even oilier. It also adds black pepper and slightly charred oak notes. I tasted some Portuguese custard tarts at the end. Finish: Pretty long with lingering peppery notes. Overall: It's perfectly balanced from nose to finish with equal amount of fruit, honey and salt notes. To be honest I got at least twice more fruit and ex-bourbon barrel notes with my first glass but then it changed with the following pours towards a less fruity and more ex-sherry barrel influenced whisky with spicy and briny notes. Not that I am complaining but definitely something you wouldn't experience too often. Anyway at the end I liked it a lot. It's a dram that won't get boring in time. It can easily be my new everyday dram. It's suitable to sip anytime of the year, anytime of the day. I have to say it is also pretty affordable for $50. It is not cheap but also not so expensive. I am looking forward for the older expressions in coming years.